One minute you’re working onsite, the next you’re creating contracts or taking calls from customers. Do it all more effectively and comfortably with the new Nissan NV. It’s the little things (like driving comforts) and the big things (like cargo room) that help you run your business more efficiently than ever, maximizing your mobility and profitability. Overtime on the road in cramped quarters can be a real bizkill. Stay on top of your game for the next customer appointment with the NV’s truck-like driving position and ample leg and foot room. In the spacious cargo area, store everything you need and keep it in its place so projects always stay on schedule. Get in and out of the van carrying materials and equipment with ease—wider doors make it a cinch. With the NV High Roof, walk in and get to work without bending over backward. And when it comes time for routine service, get to the engine fast so you can get back to business even faster. There’s no traditional van “doghouse,” so under-hood access with the NV is a breeze. With your laptop and hanging files in the lockable center console, anywhere can be a great place to access project details or catch up on paperwork. No more digging for invoices or waiting for headquarters to get you specs. Need more office space? Just fold down the passenger seat and slide the console’s work surface forward. Use the charging point for your computer or phone, and you’re always ready to go. It’s easy when you’ve got fast access to the everyday items you use on the job. • Fit small tools, stationery or first aid kits in the underseat drawer. • House flashlights, legal-size binders and clipboards in deep-door pockets. • Use the High Roof model’s overhead console to keep work gloves, safety glasses and system books securely stored but within reach. no sheet metal drilling required with the NV’s multiple reinforced attachment points. 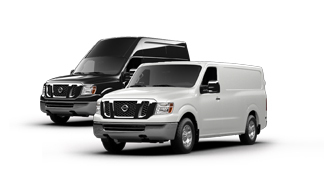 Learn how the Nissan NV Lineup can mobilize your business profitability at nissancommercialvehicles.com. And also making sure that clamps are right as well. Ladders and utility rack systems certainly will make your life easier.